Sheet Music with lyrics for 34 public domain Christmas carols with guitar chords and piano accompaniment. Included are "Jingle Bells", "O Holy Night", "Twelve Days of Christmas", "Silent Night", and many more. PUBLIC DOMAIN STATUS: The publisher has verbally advised us that all of these carols--music, lyrics, and arrangements--are in the public domain. When we requested that they confirm this in writing, they returned our letter with a sticker affixed stating in part: "Thank you for your inquiry. Although we would not want this statement construed as a warranty or guarantee, to the best of our knowledge this material is in the public domain . ." For public domain research use, a copy of this letter is included with each copy of this book. Thousands of copies of this book have been sold and no claims of copyright infringement have been made to the publisher. While this is certainly substantial evidence that all of these Christmas songs are in the public domain, this does not provide a true public domain source. This book should be adequate PD proof for limited, local usage. But if you are using Christmas songs for recording or video distribution, we strongly recommend that you work exclusively from pre-1923 sheet music publications. 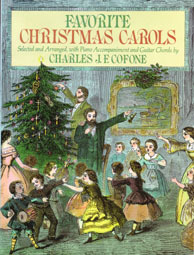 Individual Christmas PD Sheet Music Reprints can be found on our Christmas Song List Page.